Amy practices physical therapy at the UW Health Rehabilitation Clinic and specializes in neurological physical therapy. She treats individuals with a wide range of neurological problems, including neurodegenerative diseases and traumatic accidents, as well as vestibular disorders. 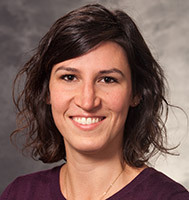 She is a member of the American Physical Therapy Association, Neurology Section, and the Wisconsin Physical Therapy Association. Amy sees patients upon referral. Amy holds a Bachelor of Science in Kinesiology and a Doctor of Physical Therapy degree, both from the University of Wisconsin-Madison.